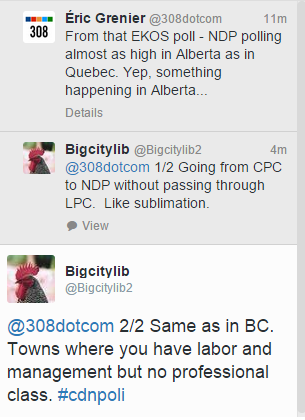 BigCityLib Strikes Back: What's Going On In Alberta (Federally)? What's Going On In Alberta (Federally)? And of course we pros form the base of the Liberal Party. Lawyers, doctors, hit-men (and women! ), dentists, Real Estate Agents, private security specialists, Where the local culture is not rich enough to support a large professional class, the LPC does poorly. Labels: Alberta and The NDP, Professionals and Professionalism. You might think that would cause some reflection within the Liberal party. After all, if current economic trends continue and the Libs are dependent on professionals, they're dependent on a shrinking demographic. Apparently the Liberal Party of Canada as led by Justin Trudeau has given up reflection in favour of blurting out whatever pops up in the moment. Policy determined by stream of partially formed consciousness. NEW NANOS NEGATES NERVOUS NELLY-ISM!!!! Oh Alberta! NDP Way In Front? Is Ezra Pulling Down His Duffy Interviews?